It doesn't get any sweeter than this! 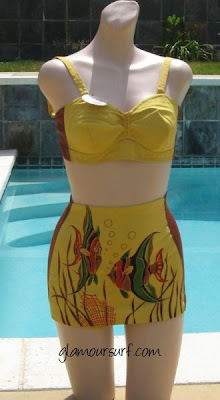 We recently acquired this woman's Catalina swimsuit which dates to 1949. This is a fabulous piece and to top it off it's new old stock, still has the tags attached. 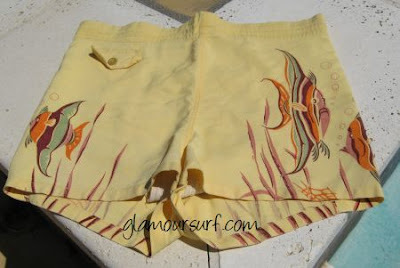 We also have the matching men's trunks, how cool is that? We can identify the name of the print. 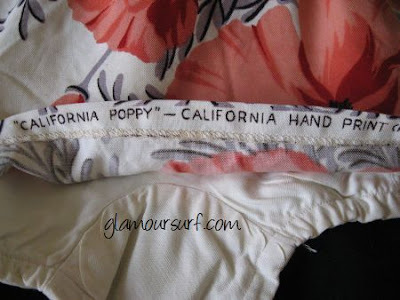 Hidden underneath the modesty panel Catalina identifies the print as "Hawaiian Fish" A California hand print. I can't find any information on California hand prints. I do know that there are vintage tablecloths and linens that are marked this way but those are not associated with Catalina at all. 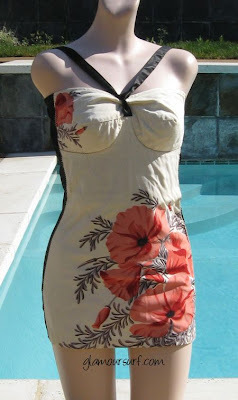 We also have this Catalina suit in our store. The print is called "California Poppy". Aren't they marvelous? If anyone can shed any more light onto the California hand prints, we'd love to hear from you! I just about passed out when I saw that you posted this suit on the vintage bulletin. You have the best swimwear! Years ago, I oggled this suit in an issue of Charm...loved it from the moment I saw it. Unfortunately, I look barfy in yellow. Oh my goodness that second suit on the girl in the first Catalina ad is freakin the most gorgeous thing I have ever seen, I think I would fall over with dis belief if I found that suit in my size. Matching mens trunks who could ask for more!